In this baseball batting techniques post, we’ll talk about how elite MLB sluggers employ Forward Momentum (FoMo for short). Does a hitter transfer all their weight to the front leg at some point in the swing? Does FoMo stride need to be big or small? Does the back foot “follow” the front with FoMo? 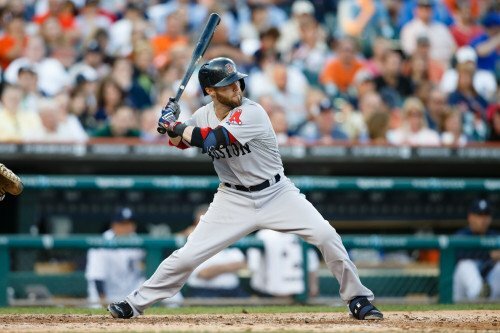 Can a wide no-stride hitter utilize Forward Momentum? Are FoMo hitters more vulnerable to off speed and breaking stuff? Keep in mind, forward momentum is the objective, and in this baseball batting techniques post, I’ll show different elite hitter examples of forward momentum. The important thing isn’t what you use to get Forward Momentum, it’s the Forward Momentum itself. Yes. With elite sluggers, it’s rare you don’t find them shifting their weight from back to forward. We typically see one of a few baseball batting techniques associated with FoMo: 1) a “Float”, or a slight weight shift back, then 2) a “Free Fall” forward. And FYI during the Float, yes it’s okay for the back knee to drift over the foot, and NOT have to unnaturally be ‘shoved’ inside it. You’ll see the following hitters, who try and start with the back knee inside the back foot (Jose Bautista), will accidently float the knee back out before falling forward. Whatever the hitter is comfortable with. In other words, don’t be so specific in teaching certain Forward Momentum baseball hitting techniques. Remember, the objective is that they’re employing Forward Momentum. We don’t really care how they get there. It doesn’t have to, but I like it too. If a hitter gets too wide with the stride, and the back foot isn’t allowed to follow, then the hitter will have a challenge getting a tight back knee angle, which is responsible for a better ball launch angle. CLICK HERE for the back knee angle Zepp experiment. CLICK HERE for one of my favorite baseball batting techniques, the Back Foot Variance Drill. Coaches on Facebook have told me, the stride is too hard to teach, or for a young hitter to get. Apparently this poison was shared during a speech at the American Baseball Coaches Association (ABCA) conference. I’m not convinced, especially when 3-year-old Chinese females are learning some of the most complex human movements in Gymnastics. Sometimes, it’s not about choosing particular baseball batting techniques. It’s a mindset. I always stress to my hitters, get athletic from the start, and be athletic when you land, so you can transfer the max amount of energy from your body, into the barrel, then to the ball. About head movement, it’s going to happen. CLICK HERE for a compelling baseball batting techniques analysis by Dan Farnsworth at FanGraphs.com, that demystifies that elite hitters are keeping their head still (Read under “Keep Your Head Still” section). A hitter can change one or the other, or both. It’s up to them. Those are the adjustments, it’s not a “stride issue”. CLICK HERE for my favorite baseball batting techniques for timing. This is common issue #2 that coaches have with Forward Momentum, a hitter cannot adjust to breaking or off-speed stuff. All these hitters had exceptional power, high averages, low strikeouts, and high walks compared to today’s hitters. When it comes to baseball batting techniques, Forward Momentum is the objective. How we get our hitters there doesn’t really matter. Just give them examples of how to accomplish more FoMo, and allow them to tinker and test until they find something they’re comfortable with doing. Contest UPDATE: this contest is now closed, and Jon Ball was our winner! What does it mean that the back foot follows? Jeff, I call it “skipping the back foot”. Watch most of the videos, and pay particular attention to the back foot during the swing. You’ll see it ‘follow’ the front during the the Final Turn. Another thorough job, Joey! Is there anything left to say about this? Even Albert Pujols is back to striding. Look at David Wright. Is the decline in his power production attributable to his no stride/no follow up foot skip swing? Joe, I think a combination of things. One thing in particular is the chronic injuries he’s seemed to develop over the past 5 years. FoMo makes everything easier. Got to get the forces of nature work g for you and not against you. Great slow motion shot of McCutcheon skipping the back foot last Sunday vs. the Cubs. You got it Joe…swim downstream, not up. Cutch is a beast! Would a hitter be more likely to skip the back foot on a high pitch rather than a low pitch? Just saw Pujols hit a HR vs. Cole Hamels. He was back to striding and skipped the back foot as well. Joe, not sure skipping with high v. low pitches. Would have to watch a lot of film to see the truth in that. I teach skipping no matter what pitch. Simplify. I think Pujols strides with 0 or 1 strike, but not on 2-strikes though. I could be wrong there, but his stride is still very minimal to me, compared to his almost equally big teammate Mike Trout. foot skip, all every thing this arice discusses..
You’re absolutely correct Joe, and he’s a biggin’ too! Text book, right out of ” The Truth About Explosive Rotational Power. ” But Gomez last night might be the prototype. Didn’t realize that Carlos Gomez is 6-3, 220. It’s scary when big sluggers adopts these human movement principles. Joey, don’t you think that the teaching of the stride to younger players is a concern to coaches because they don’t understand that the hands are kept back by showing the numbers to pitcher (spring loaded)? The fallacy in hitting is that the weight is the part that keeps hands back to adjust to off speed pitches. If that was understood then I believe that it is really easy to teach to anybody no matter the age. Mike, yes we as instructors are continually fighting conventional wisdom which is the majority philosophy these days. “Sitting back” destroys hitters from being aggressive. Footwork is one of the first things I teach my hitters, then I move on to the Catapult Loading System. I do this because involves re-calibrating the timing. And the latter being of most importance. Once my hitters get to showing the numbers, they really start dropping the hammer, and is where my 60-lb hitters are hitting the ball with 64-mph of Ball Exit Speed, OR my 98-lb’er hitting the ball consistently over 300-feet. I really wish you would include more fast pitch examples. I have your program and have been working with my daughter. Her mechanics are improving but we encounter so much resistance from coaches. Having good fast pitch examples would help educate her more clearly. Thank you. She’s using what I call ‘shifting foot pressure’. I’m moving my girls to this because of the difference in pitching distance and reaction time required for fastpitch. This shifting foot pressure still gets the job done, while staying within the guidelines of forward momentum. This is what golfers use. I did an experiment with 2 students hitting off of a tee using no stride, and about a 6″stride. They were 2 sisters with pretty solid swings but no forward movement. I tracked their ball exit speeds using both swings. The stride swing averaged about 5-6 mph faster than the no stride no fomo swing! Were you comparing one girls swing (stride fomo) versus the other girl’s swing (no stride)? How many swings did each take to get those numbers? Just because there is no weight on the back foot does not mean that all of the weight is on the front foot. It is absolutely clear that the center of mass is still between the two feet. They are just in an unstable position at the moment of contact with a fraction of their weight (less than 100 percent) on the front foot and the rest unsupported between the feet. So, forward momentum is a thing, but it’s only going about half as far as you propose. All of your videos show it if you look carefully. The center of mass is not above the front foot in a stable position at the moment of contact, it is somewhere in between the two feet. Michael, a hitter’s weight and center of mass are two different things. Yes, center mass is behind the front leg with most elite hitters, however their back leg is ‘weightless’, evidenced by ‘no weight’ showing on the back foot. Look, we’re talking about transferring forward momentum, the hitter’s weight has to come off the back leg because we’re moving dynamically. Sounds like we’re describing the same thing but in different language, with the premium on defining terms.